You can do this in a food processor or by hand. I did it the easy way, in the food processor! First, in a small bowl whisk together the cream, egg, and vanilla until combined, set aside. In the bowl of the food processor add the flour, sugar, and salt. Pulse a few times to combine. Add the cubed butter 1/3 at a time, pulse between additions so it doesn't all stick together. Pulse a few times until the butter chunks are about pea-sized. Scrape sides and bottom as needed to ensure no extra large butter pieces. Slowly stream in the cream mixture and pulse until a ball forms. Turn out dough onto a large piece of plastic wrap that has been lightly dusted with flour. Form into a circle that is about 1 inch thick. Wrap in plastic wrap and place in the fridge for at least one hour. You can make the dough up to two days in advance. Preheat the oven to 400°F degrees. Roll out the dough on a lightly floured surface to about 10-11 inches in diameter. Place dough into a greased 9-inch pie dish, pressing the dough into the bottom and up the sides. Cut off any excess dough. Place in the fridge for 10 minutes. Using parchment paper or foil, line the dough and then add pie weights (If you don't have pie weights, you can use uncooked rice or dried beans.) Bake for 10 minutes, remove weights and parchment paper or foil carefully, prick a few holes on the bottom of the crust. Reduce oven temperature to 350 degrees. Place crust back in the oven and bake an additional 5-10 minutes or until crust is lightly golden brown. Let cool completely on a wired rack. While the crust is cooling, make the filling by placing the mascarpone into a medium-sized bowl. Using a hand mixer whip on high for 1 minute until smooth. About 1 tablespoon at a time, add in the heavy cream and whip until smooth. Add the sugar, vanilla, and coffee extract and whip until smooth one more minute. In a large bowl, add the heavy cream, with a hand mixer whip on high until soft peaks are formed. Add the powdered sugar and cornstarch a little at a time, whip between additions. Add the vanilla and whip until medium to stiff peaks form, do not overmix or you will have butter. Mix together the Marsala wine and 1 teaspoon coffee extract in a shallow bowl. Place half of the mascarpone filling to the bottom of the pie crust and smooth out. Break the ladyfingers in half and dip the bottom into the Marsala mixture. Place on top of the filling, I placed them in a circle around the outside with one in the middle. With the remaining Marsala mixture, brush it on top of each cookie so it is all absorbed. Cover cookies with the remaining mascarpone filling. Place in the fridge for two hours to set. Top with whipped cream. You can pipe it on like I did in the photos or just smooth it on top. Sift on a small amount of cocoa powder, serve. *Mascarpone curdles extremely easily. If this happens to you, don't panic! Still mix everything together. Then place a small pot on the stove with 3 inches water. Let the water come to a simmer over medium-low heat. Place bowl on top and whisk constantly until all lumps are gone and the mixture is smooth. Place on the counter and let come to room temperature. Whip a few times before using, now you're ready to assemble your pie! 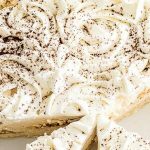 Tiramisu Pie Recipe found on https://thissillygirlskitchen.com/tiramisu-pie/ *All nutritional information is approximate and may not be 100% accurate. Please consult a nutritionist for more specific information.